Do we see and hear about Isis a lot in Egypt? Yes, of course, because Isis refers to the local goddess, who predates the Islamist terrorist group by many thousands of years. I feel bad for her that her name has been corrupted like this. If I sound glib about traveling in the Middle East right now, it's just nervous defensive humor. Once the sh*t hits the fan, the decision about whether or not to go on our planned trip to Israel, Jordan, and Egypt is actually quite stressful for me. I'll never know what causes my pre travel anxiety. Is it simply the attacks, the gray weather, and the gloominess of Paris and world politics? Is it augmented by my post-surgery sleeplessness and cancer-preventing hormone pills? Whatever the combination of causes, there is a week or so where I am unable to sleep trying to make this decision. I start to cry every time I talk about it. And I have paranoid visions that one of my children will be killed on the trip. I'm a mess. But I call people I know in the Middle East and one State Department relative asks around to all the relevant American Embassies, and everybody tells me it will be fine. At some point, I decide I'm being melodramatic about it all, shrug, and decide to go anyway. We think about the statistics: we're still way more likely to be shot and killed virtually anywhere in the US than on this trip. There's a thought that really cheers a person up. Now that we are all back safe and sound, I can tell you the trip is a big success. But that I do, indeed, feel a sense of relief to have made it through with no glitches, other than being harmlessly and hilariously accidentally kidnapped by a kind taxi driver in Aswan. It was my fault. Let's not mention it again. If you notice in the photo above, the entrance to the Luxor temple looks oddly asymmetric, and that's because in the 1800s, the first Governor of Egypt, Muhammed Ali (no relation to the boxer, obviously) did the unthinkable: He offered the obelisks -- yes, both of them -- as a gift to France. Only one of them made it, and it stands in the Place de la Concorde. The obélisque, as it is known here (as if it were the only obélisque, anywhere), arrived in Paris in 1833, and was placed in its current home at Place de la Concorde in 1836. But it is actually a monument from around 3,000 years ago, making it officially the oldest man-made thing in all of Paris. 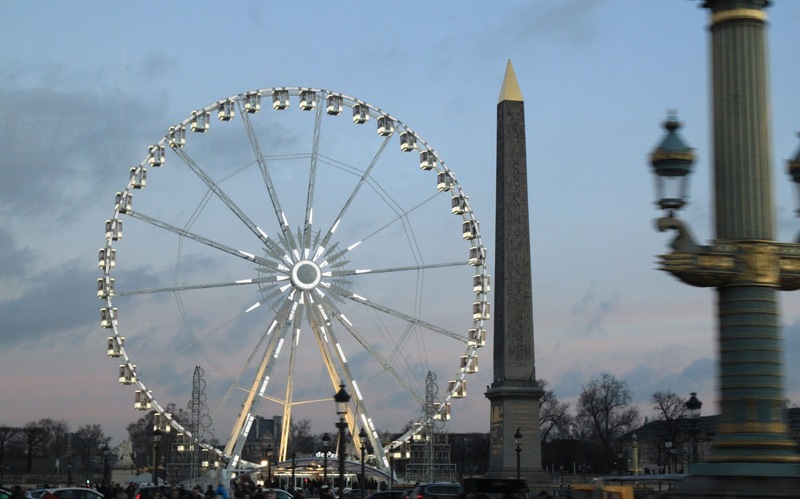 In order to move such a monumental monument, the French had to build a special boat, then dig a special canal, then deal with hoisting, moving, and erecting the thing in the Place de la Concorde. And speaking of erecting, here are a couple saucy tidbits about the obelisk: According to Wikipedia, "the original Egyptian pedestal included the statues of sixteen fully sexed baboons and was deemed too obscene for public exhibition" and is now on display in the Louvre. In 1993, an anti-AIDS charity called Act Up Paris covered the obelisk with a giant pink condom to make a point (pun intended). And twice, in 1998 and 2000, the French "Spiderman" (Alain Robert) scaled to the top without ropes or safety harnesses. In 1998, under President Jacques Chirac, the top of the obelisk was re-gilded, whereas the gold from the one still in Luxor lost its luster (try saying that 3 times fast) sometime around the 7th century. The hieroglyphics (spelled "hierogluphics" on a postcard we bought in Egypt) on the pair of obelisks tell tales of Pharaoh Ramses II. We learn a lot about him during our trip there, but the fact that we'll most remember is that he had approximately 200 children (numbers vary: who can keep count?). Why would Governor Muhummed Ali give away the obelisks? Besides being a grand gesture of international friendship, he also had shockingly little respect for his own patrimony. For example, he proposed taking apart the pyramids for stones to use elsewhere. Luckily, it proved too difficult and expensive, and all that was removed was the top stone before he gave up. And what did Egypt get as a gift in exchange for the obelisk? France gave Egypt a....clock. Which broke after two weeks. Ergo our favorite new family cry: "E-gypt us!" Luckily for the Luxor Temple, it was such an expensive and arduous undertaking to move the 220 ton single block of stone, France only took one of the obelisks. Technically, France still "owned" the other one -- still in its original place in Luxor -- until 1981, when French President Francois Mitterand gave up claim to it in a gesture of friendship that was largely symbolic because, let's face, who was actually going to finance to move it?! 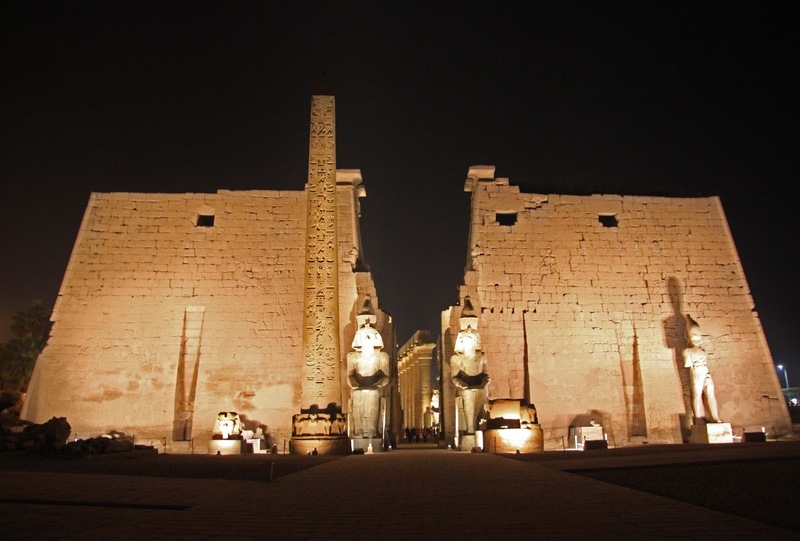 The Luxor Temple in Egypt may have been left asymmetrical, but it's still an absolutely gorgeous temple. We are awestruck. I love the walls and walls of language and story-telling. Unfortunately, hieroglyphics is not one of the languages I can read. Gigi, meanwhile, is so taken with our trip (especially Jordan, which we adore), she starts to learn to read and write in Arabic, asking anybody -- waiters, flight attendants, tour guides -- to help her learn. Our little history buff also appreciates the intersection here with French history, and not just at Luxor. At the Philae temple in Aswan, there's essentially a "Napoleon Bonaparte was here" sort of message inscribed in the ancient stone temple. At what point does inscribing something on an ancient temple become desecration or graffiti -- even for Napoleon? One of the two things Pippa knows about before our trip here and definitely wants to see is the Nile, which she is studying in geography class. In fact, we see it everywhere on our trip, but we especially enjoy sailing around it in Aswan. Much better than a history class in a Parisian schoolroom. Another thing that starts to appeal to Pippa is the idea of King Tut's treasure at the Cairo Museum. It's the very last thing we do in Egypt before eating a New Year's Day Chinese dim-sum dumpling dinner at the Four Seasons in Cairo and getting on a plane home (odd, I know, but there's only so much falafel a person can take). This may be the only museum that Pippa has ever looked forward to. She can't wait to see the treasure, knowing that all the others were stolen from the tombs in the Valley of the Kings long ago. But she can't even imagine the riches she will see. She tells us after the visit that she pictured a mirror with a treasure chest and coins and jewels in it -- basically, every pirate treasure picture you've ever seen in a story book or Disney film. Between King Tut's burial objects, which are a billion times more incredible than pirate treasure, and the mummies, she doesn't complain once about being bored. She is suitably fascinated, along with the rest of us. Luxor is undoubtedly our favorite part of Egypt, but I don't think I can post without at least showing the pyramids. The Saqqara step pyramid is not the most famous or often-visited, but it is the oldest pyramid and stone building complex on the planet, built in roughly 3000 B.C. And finally, we get to see the other thing Pippa really came for: The Great Pyramids of Giza. At first, she calls them the Great Pyramids of Gyoza, which just shows our family's level of obsession with Asian dumplings (see New Year's Day dinner plans, above). 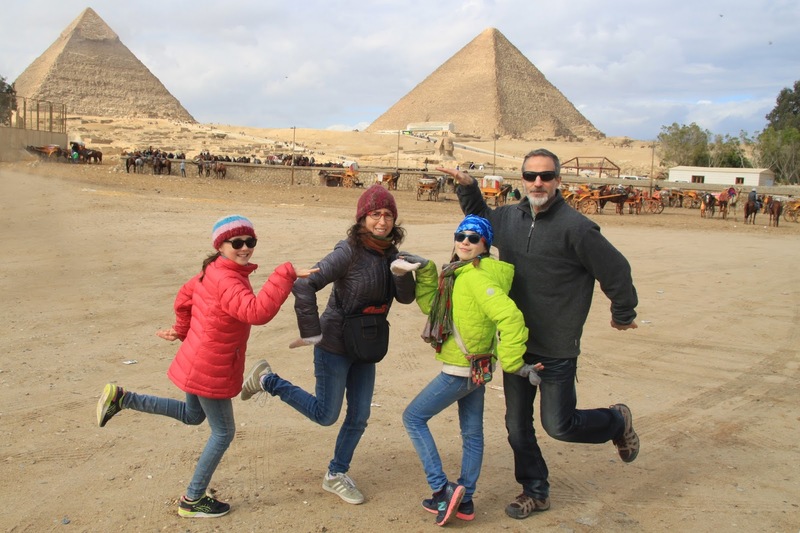 We are incapable of leaving without one cliché, tacky "Walk Like an Egyptian" photo. We apologize. We run into very few Americans in our trip to the Middle East, and even fewer families with young children. We all understand why. But I have to say that we feel safe and enjoy the trip tremendously, without stress or fear. Pyramide de Chèvre is a huge disappointment in that, as far as I'm concerned, it's neither a pyramid nor a good chèvre. Pasteurized and artificial tasting, despite being made from organic goats' milk, Napoleon Bonaparte, King Louis-Philippe, President Mitterand, President Chirac, the French Spiderman, and every other true-blooded Frenchman named in this posting (or not) would be ashamed to call this a French cheese. While the names are basically the same, this Pyramide de Chèvre (Frais) is not to be confused with a simple Pyramide, a goat cheese that is aged, raw, and non-industrial in every way. 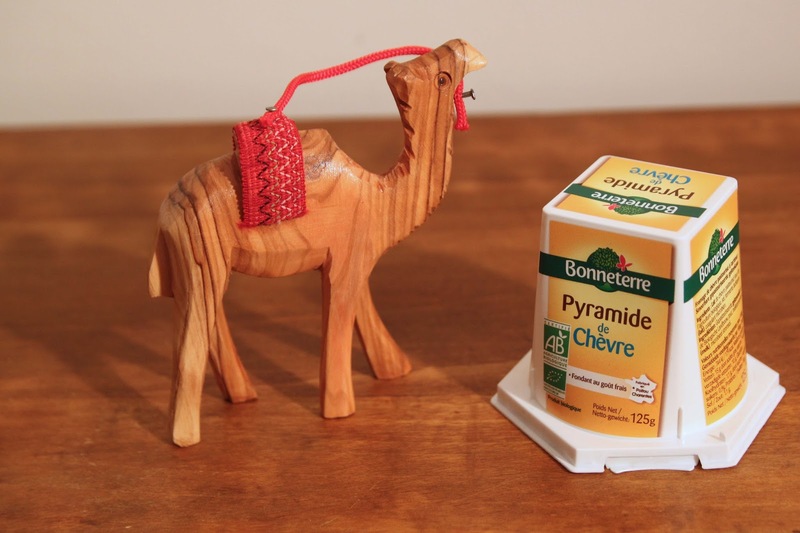 I have photographed it next to our souvenir Christmas-tree ornament camel not to show size or scale (since you don't know how big our souvenir Christmas-tree ornament camel is, anyway) but just because I think putting a camel next to a "pyramid" is funny. Not so funny is the cheese itself: I open it and, after pouring out the whey, realize it will have to be stored upside down; therefore they have labeled it wrong. I am most offended by the shape, which is round at the bottom and slightly tapered. They obviously don't know what good cheese is, but do they also not know what a pyramid is?! Since it is soft, I take matters into my own hands. Literally. Here is a sticky attempt at forming this cheese into a pyramid. If you're thinking "Ooh gross! Who would want to eat that after she mangled it?," you should know that nobody would want to eat it even if I didn't mangle it, because it's not delicious. So I might as well have fun photographing it. That's 5€ down the drain. The texture is somewhere between firm yogurt and whipped cream cheese, and the taste is somewhere between slightly goaty and a little too salty. I don't want to spread it on my bread, and I'm afraid if I try to make cheesecake with it, it will just be a case of throwing good ingredients after bad. All I can say for it is that it's a whole lot more edible than this famous Egyptian cheese: Mish (sometimes spelled Mesh), a cows' cheese. Yes folks, that's right, you're getting the first-ever two-for-one cheese post, since I want to be fair and include a French cheese, but I sure as heck want to share my Mish experience with you. I don't like to suffer alone. Served to us one morning at the breakfast buffet at our Aswan hotel, I of course try it. Egyptian cheese? A local specialty? How could I resist? I should have resisted. It turns out to be a fromage fort -- a collection of old cheeses (especially Karish cheese) mixed with dairy (buttermilk, sour skim milk, and whey) spices and herbs (red and green pepper), similar to the style of Foujou or Pétafine. They mix it all up then store it in pottery and bury it to ferment for weeks or -- in the case of the one I taste -- months or even years. Apparently, the homemade ones often contain tiny worms. I only find this out after the fact, which is good, since that might have dissuaded me from trying it. Even after the fact, I'm not afraid I accidentally ingest any worms, since I immediately spit the Mish onto my plate and swallow nothing. When I say strong, I mean strong. And unexpected. And especially at breakfast. Mish (or something similar) has been found in the tomb at Saqqara of a First Dynasty Pharaoh from approximately 3000B.C. -- that's over 5,000 years ago. The one I eat tastes like it's been aged over 5,000 years, too. 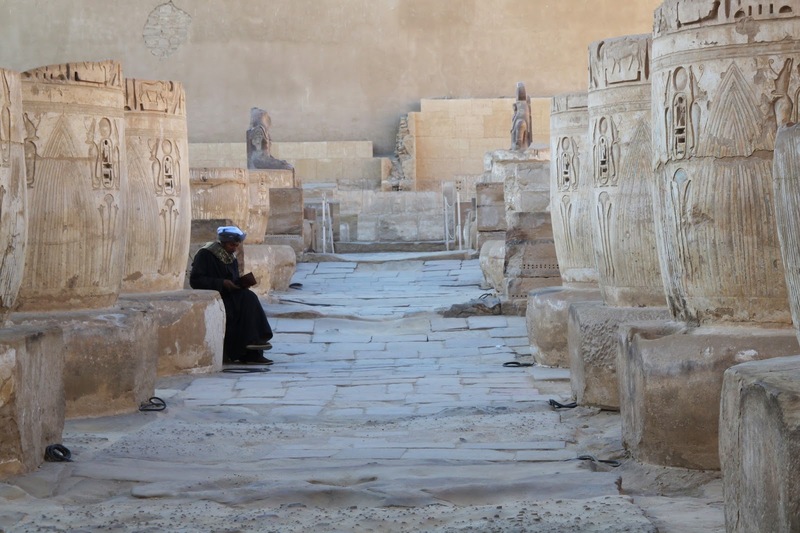 Though our Arabic studies don't get us much further than reading/writing (Gigi) and counting to 10 and saying basic tourist words (the rest of us), apparently there are two relevant Egyptian expressions: To be "everywhere, like Mish" means to be common. And "the worms of the Mish rise out of it" means that a problem that can't be solved is just not worth worrying about. I know that some of you read the story, then skip over the cheese part and just read the connection. If you are one of those scofflaws, you need to go back and read today's cheese section. Honestly. Trust me. So why did I choose Pyramide de Chèvre and Mish? About 5000 years of history and nearly 500 cheese postings have brought us to this intersection of French and Egyptian cheese, twin obelisks in Luxor and Paris, and things that are pyramid-shaped (there's even a pyramid-shaped sculpture temporarily next to Paris' obelisk). While some may not see this as the safest/smartest thing I've ever done, it turns out there's a good reason for a Parisian-based American writing about French cheese to travel around Egypt.